Planning on doing a trade show announcement for your newest product? You’re definitely not alone. The buzz surrounding tech events like CES, IFA, and CEDIA (to name a few) makes them incredibly effective venues for product announcements. CEDIA 2017, for instance, had over 70% of its exhibitors launch a product, and saw more than 20,000 attendees. Trade show announcements are great PR, but opening your pre-release product to scrutiny from customers, competitors, and the press comes with significant risks. You need the right messaging to compel your audience, as well as a savvy team that knows the product features inside and out. Most importantly, you need to be sure that your product will perform well when the pressure’s on. Luckily, there are a few ways to make sure things go off without a hitch. Messaging is often the first interaction that potential customers have with your product, so a cohesive strategy for getting (and keeping) their attention goes a long way. This is critical if you’re planning a trade show announcement. Exhibiting is a huge investment, and your return on that investment depends on how well your product stands out from the competition. The most reliable way to know what your customers care about is, naturally, to ask them! Leveraging the Beta efforts of your support, QA, or research teams is a perfect source for harvesting customer quotes. It’ll arm you with preliminary NPS scores, usage data, and key customer interests – directly from your target market. In addition, it’ll give you a better understanding of the customer experience and allow you to focus your messaging at the event away from specific product areas that don’t interest your audience. Not only will your pre-announcement customer data help you set your product apart from the competition with deep, real-world knowledge, it’s also good PR. Talking publicly about your Customer Validation efforts shows the world that your customers matter to you and that you’ve based your product decisions on their needs. Good salespeople are skilled conversationalists, able to listen closely during an exchange and relate the interests of potential customers back to your product. They also have important product expertise, which enables them to display relevant features that in turn generate sales. During a trade show, your team will lean on both of these skills to showcase your product to many different people. Employee testing gives your entire team this product knowledge. 96% of companies are running customer tests, and many of those companies are running employee tests as well. In fact, there’s a good chance a program like this already exists in your organization (if you’re not leveraging it already). Specifically within sales and marketing teams, these tests are an opportunity to see how the product behaves in real-world environments and gather insights on personal experiences that strengthen your ability to sell your product. Getting engaged with your Customer Validation program promotes the product within your company, and gives you immediate access to your potential target market. Hands-on, company-wide engagement with the product deepens your understanding both of how it works and how users will actually use it. Finally, for the trade show announcement to go off without a hitch, your product needs to work reliably. Nothing will shake trust in its capabilities like a key feature failing in a public forum – even Apple’s stocks fell immediately after the iPhone X facial recognition gaffe in 2017. A trade show shouldn’t be the first time you’re using your product in the wild. While you can’t always guarantee the conditions of the event space, you can guarantee that your product works in a variety of natural use scenarios and customer environments. Working closely with your customer testing team gives you foresight into your product so there are fewer surprises at showtime. Knowing what needs to work from a customer perspective (especially after testing it yourself) means your team will be more comfortable showing it off. These are just three ways that validating your product in real environments with real customers will help make your trade show announcement a success. To hear how Customer Validation enhances your product before, during, and after launch, sign up for our newsletter! 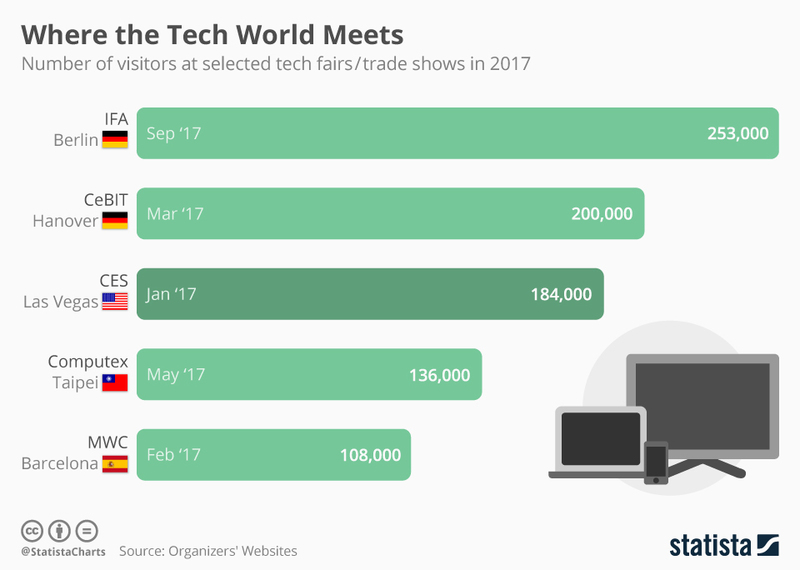 “Where the Tech World Meets” – Download the chart from Statista here.